Ochazuke (ocha meaning tea and zuke meaning submerged) is like nothing I’ve ever had before, and I mean that in the best way. It’s a fuss-free lazy day fave amongst the Japanese (and now me) that is typically served in an overly large bowl, because let’s face it: the bigger with some foods, the better. This is why bowl meals are trending, folks. But a large mug, cereal bowl or soup bowl will work just fine. The idea is to be able to curl up and get comfy with this bad boy, so if you have a vessel that allows you to do that, all is right in the world of Ochazuke. Common toppings include savory ingredients like salted salmon, shredded nori, wasabi, pickled vegetables, mitsuba, toasted sesame seeds and broken Japanese rice crackers for a salty crunch; it’s all about preference. Comfort food. Everything I’d read about this dish suggested that it was total comfort food and, seeing that it’s February and winter is still daunting us, that’s what we’re after. Best of all, it’s a cinch to make — so if you’ve had a long day or simply want to bask in some weekend laziness, Ochazuke is where it’s at. Tea as a broth. I would have never thought to use straight up green tea, or any tea, as a broth for a savory dish — but here we are. Part of me feared the green tea would drown the dish in a sea of muted flavors, but as long as you use a quality tea like Arbor Tea’s Organic Genmaicha (pronounced GEN-my-cha), you’ll end up with an earthy flavor that is cozy and soul-soothing. There *is* another variation of Ochazuke that replaces green tea with dashi stock, but between the Spicy Shoyu Ramen and the Okonomiyaki in this series, we’ve seen dashi aplenty. I wanted to honor the simplicity of this dish and, even more so, give this whole green tea as a broth thing a whirl. I’m thrilled to report that it. was. ah-mazing. Since green tea is a prominent ingredient in this recipe, I wanted a high-quality blend that would provide a natural and earthy flavor. Nothing overly potent, but certainly not something that would leave the dish watered down. Arbor Teas selection of tea in general is impressive, and their greens are absolutely perfect for Ochazuke. Needless to say, when Arbor Teas and I decided to partner up for this post, I was elated; I get to shed light on an ingredient that is not only tasty, but sustainable and fair-trade. High five! It’s also worth mentioning that Arbor Teas’ packaging is backyard compostable. So, you know, if you respect the earth you walk on, double high five. When it comes to selecting a type of green tea, Ochazuke gives the warmest welcome to Houjicha, Genmaicha and Sencha. After spending a rainy afternoon blissfully sipping these teas to test them out (blog life is haaaaaard), I decided that Genmaicha was the one. Some may think that green tea is green tea no matter how you blend it or brew it — but any tea snob who has consumed enough quality teas (Quali-teas? #Qualiteas — can we get that trending?) will tell you otherwise. Even I myself, a devoted coffee drinker, could notice subtle differences between the three blends. That, my friends, is good tea. So, why Genmaicha? Arbor Teas’ blend is made up of organic green tea and organic toasted brown rice giving it a toasty flavor that is light-bodied and carries minimal bitterness; broth-y perfection, y’all! And will you just look at those swoon-worthy tea leaves and toasted rice pellets? Though the concept of this dish may seem far-off from the bowl of feelgood soup that you’re used to, the similarities are undeniable. 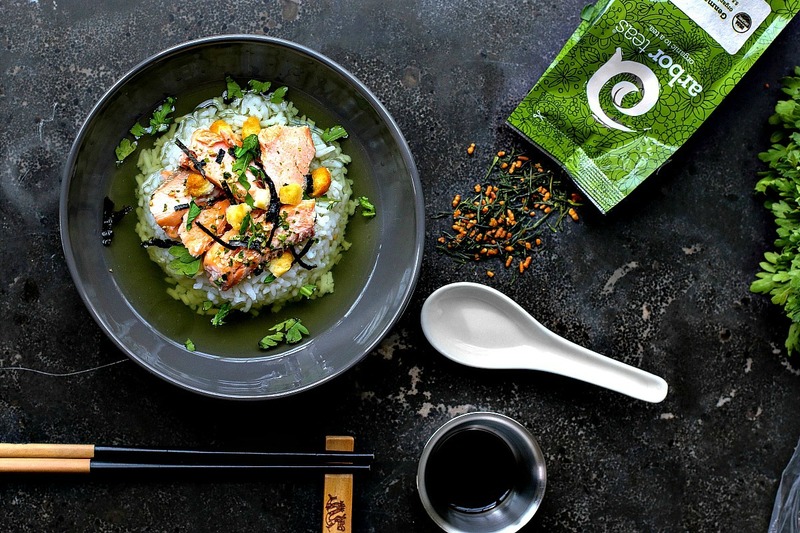 The heartiness from the rice and salmon are reminiscent of your standard chicken and rice soup; the hot tea, which you can add a tablespoon of soy sauce to for extra flavor, is as belly-warming as any other soup broth out there. And, if you dig salty crackers in your soup, we’ve got that covered with Japanese rice crackers. This dish is a total win, and though you won’t find it on many restaurant menus outside of Japan, you can easily find the ingredients at your local Asian market to make it in the comfort of your own kitchen. To see more of what Arbor Teas has to offer, you can check out their Website. Don’t forget to like them on Facebook and Instagram as well! THIS RECIPE IS PART OF MY EAST SERIES. In this series, I’ll be covering dishes from Japan, China and Korea to cover East Asia, followed by dishes from Thailand, Vietnam and Indonesia to cover Southeast Asia. Ochazuke is a comforting Japanese dish that includes rice, a hot broth of green tea and various savory toppings. In the meantime, prepare/cook the rice. Salt the salmon fillet and bake for 15 minutes. Prepare the tea and set aside. Once the salmon is done, flake it with a fork to break it down into bite-sized pieces. Place the rice in a large bowl and top with the salmon and your selection of savory ingredients. Add soy sauce to broth if desired. You think Matcha would do the job also for the broth? Really interesting those flavours, you got me intrigued... have to try it out! Hey Marie — I can't say for sure that Matcha *wouldn't* work since I've never tried it in this dish, but I'd definitely stick with the genmaicha, sencha or houjicha for their clean, light and earthy flavor. I'd be afraid that the matcha would bring a sweeter note that might not agree with this dish. But, if you try it, keep me posted! I love green tea with toasted rice and TOTALLY love the concept of this dish. It looks phenomenal Dana. I really want to make this, just need to pick up Salmon! Thanks, Bernice! I agree, the toasted rice in genmaicha tea leaves is so tasty, and really just perfect for this dish. I hope you do try this — let me know! I'm a huge fan of genmaicha, but I've never used it for cooking before, so I'm very intrigued by this dish... definitely my kind of comfort food, especially since it's not as heavy or fattening as some of my other go-tos. :) I think I might just pick up some salmon on my way home and give it a try. It's snowing like a mofo out there, and I need something warm and comforting for dinner! Hey Isabelle, I hope the snow subsided and, if you did make this dish, I hope it warmed you up! I certainly don't miss snow, but luckily we get chilly enough weather here in NC to justify cozy dishes like this for a few months. Luckily, Spring is near! Such a comforting dish - so light and soothing to your senses. I would love to try it out. But just wondering where i could buy the rice seasoning and mitsuba. Thanks for sharing. This looks like such a light but comforting meal. Dana, this looks A. Mazing! I love to experiment with tea in my cooking. I really love the toasted rice pellets in that tea This is a beautiful dish that I cannot wait to try. Japanese dishes are always so incredibly elegant in their simplicity and spot on flavours. Plus your photos are gorgeous. ( I hope I get you in a Recipe Nod one day, ha ha) Great post.